Pop can’t get any more danceable than a session with Nightly! We approve. The Nashville-based pop band kicked it in to high gear for the healthy-sized DC9 crowd on March 29th, on their first full headlining tour. Jonathan Capeci (on vocals) talked about how they had played in DC many times in the last couple years, including performing at DC9, and the reaction for this tour was crazier than expected, especially from us in the crowd. We resembled that remark. Just before 8:30pm, the empty DC9 stage was consumed by a thick fog, and as it slowly dissipated and engulfed those in the front, Nightly stepped up and the three members stood silhouetted eerily by the back lights. They kicked off their 13-song set in the fog with “No Call, No Reply”, a new single where Jonathan’s rich voice could make you believe he was fronting a mini-boy band, just without all the choreographed dance moves. That’s definitely not the case since they play their own instruments. Nightly came to life on the bonafides of cousins Jonathan and Joey Beretta (on guitar) in 2016, after another band they’d started together didn’t pan out. They also have Nicholas Sainato on drums. Next came “Miss You Like Hell” from their latest EP, The Sound Of Your Voice. Many of the people in the front, now looking mysterious in the mist, were well aware of the lyrics and the beats, as they joined in a big sing-along. The entire crowd got into their own dance groove, limbering up for what the night was about offer. “Phantom”, also from the new EP, is about the memory of someone who is gone haunting you, and was probably my favorite song they played. Its urgent plea weaves in perfectly with the minimal beats that turn into a soaring chorus. 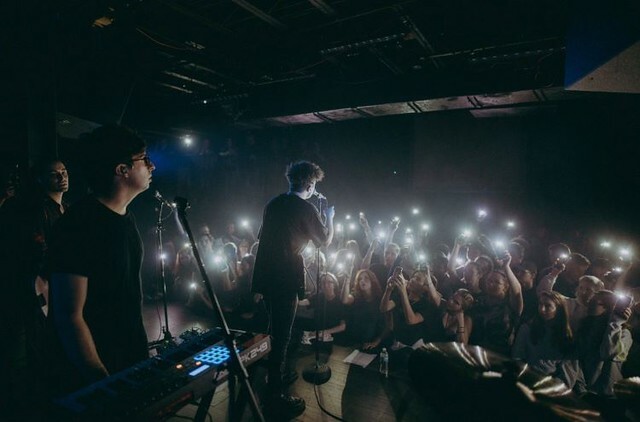 It would be fair to say, most of Nightly’s lyrics are about lost love and relationships, as in the case of “Honest”, midway through, that bared the raw truth on the state of a relationship, yet also led everyone into a frenzied bounce dance. “Twenty Something” is a slower, soulful song, and gave people a chance to catch their breath, with down tempo beats better served for swaying. They ended the excellent set with the slow jam of “Vacancy” and then “XO” off their first EP, Honest. No one was ready for Nightly to stop (luckily DC9 had a dance party planned for afterwards), but all walked away happy and humming something they heard that night (presumably, or just me). They played all six songs from The Sound Of Your Voice, and we give the thumbs up to go ahead and purchase that EP right now. Also, get yourself on any sort of alert system so you can be there next time Nightly plays in DC, they were a lot of fun to see live (and to dance to).